Lobelia is an annual or biennial; the erect, angular stem, growing from 6 inches to 3 feet high, is hairy and contains a milky sap. The thin, light green leaves are alternate, hairy, ovate, and bluntly serrate. Numerous small, two-lipped, pale-blue flowers grow in spike-like racemes, to 1/4 inch; from July to November. The fruit is a two-celled capsule filled with small, brown seeds. Other varieties: Great lobelia (L. siphilitica) (potentially poisonous); Cardinal flower (L. cardinalis); and Pale-spike lobelia (L. spicata). Found in fields, pastures, meadows, and cultivated fields of the eastern United States, as far west as Arkansas and Nebraska. Related species are found in other parts of the country. Alkaloids, chelidonic acid, isolobeline, lobelic acid, lobeline, selenium, and sulfur. Lobelia is used in commercial smoking preparations to counteract the desire for tobacco. The Shoshone Indians used lobelia as an emetic and a laxative. 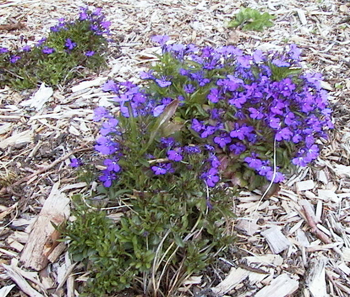 In the past, lobelia was used particularly for its antispasmodic qualities to treat asthma and whooping cough, and also to induce vomiting. Externally, the plant can be made into a poultice for bruises, insect bites, worms, croup, epilepsy, sprains, felons, ringworm, erysipelas, and poison ivy irritation. 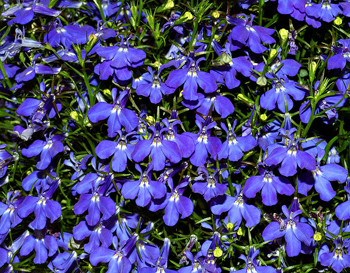 Lobelia is a cough suppressant and relaxant that reduces fever and cold symptoms. Beneficial in the treatment of sore throats, laryngitis, colic, bronchitis, pneumonia, meningitis, hepatitis, pleurisy, tetanus, chorea, convulsions, angina pectoris (chest pains), and epilepsy. Aids in hormone production. Although some herbal practitioners have sworn by lobelia as a harmless but effective panacea for what ails man, overdoses of homemade medicinal preparations have resulted in poisoning. Care should be taken to follow directions in formula or recipe given for medicinal purposes. Considered toxic, due to its strong emetic, expectorant, and sedative effects. This plant has been, rightly or wrongly, implicated in deaths from improper use as a home remedy. Use professionally prepared medications under medical supervision only.